People, who are constantly involved in welding processes, have the risks of harming self if proper protection is not taken. Face burns, reactions from UV as well as infrared light, harmful sparks etc are some amongst the many threats. Thus, proper protection is of utmost necessity. 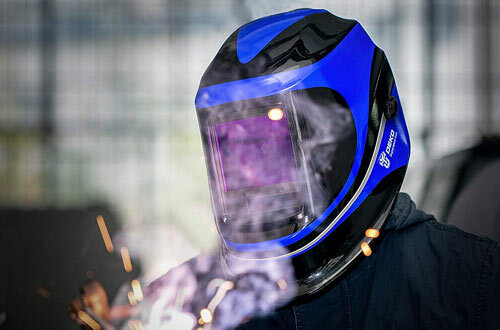 In order to help the workers get the work flawlessly done without getting damages, the welding helmets should be worn. Designed to stay protected against any sort of threats, these helmets have flexible shades that are adjustable. Treated properly and providing effective results, the helmets will be your true companion. However, not all are as good as they claim to be. Some may even not be authentic. So how to identify the best ones? In that case, choose the welding helmets listed in our article and make a wise decision. 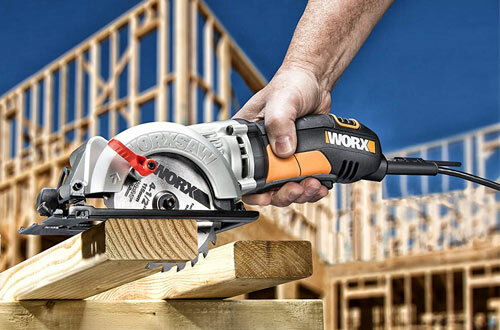 Lincoln makes one of the best worksite equipment and its helmets are a class apart. 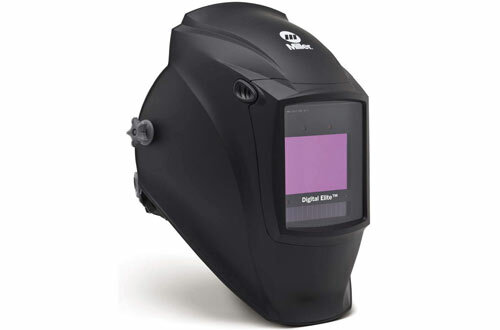 This helmet from Lincoln Electric has it’s the signature 4c lens. 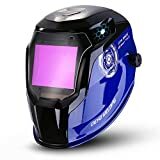 The auto-darkening welding lens enables you to observe the welding arc in true light instead of that green or yellow hue you find in traditional helmets. It is also a great leap from previous models. You get the same width compared to 2450, but a lot taller. This gives you a greater field of vision which really comes in handy when you are doing detailed precision demanding work. It also comes with an optical clarity rating of 1/1/1/1 which is one of the highest in the market. Furthermore, your work experience really has a significant boost with that kind of optical clarity. The headgear on this helmet has a hinged design and a strap adjusting dial. As a matter of fact, the hinge allows back strap to find the right place on your head. And the dial lets you tighten the strap according to your requirements. Together, these two features add up to make the headgear really comfortable to wear for long periods of time. Weighs just a bit more than 3 pounds. Works with a single Lithium metal battery. Super wide shade rating which goes from a low of 5 to a high of 13. The major problem with helmets for welding is that they don’t have an option to readily switch modes. 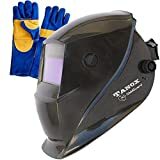 You have to take your helmet out or in better cases switch off the welding torch and take off your gloves to switch modes. But the A50 has an amazing feature that solves this problem and saves you a lot of time and trouble. It has a grind button near the front lens which is used without taking off gloves or interrupting your work. If you are using knobs to adjust various parameters then you are in for a pleasant surprise. Furthermore, the A50 has a large touchscreen to adjust several settings and looks really futuristic. While other helmets can’t go too low on the shade, with most being limited at 9. To your surprise, the A50 has a wide range which goes from 5 to 13. 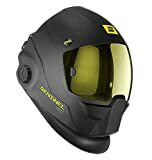 The headgear has multiple straps which have immense adjustments capabilities and would really be comfortable for anyone. As a matter of fact, you also get a large knob for adjusting the straps. This really helps when you have your gloves on. 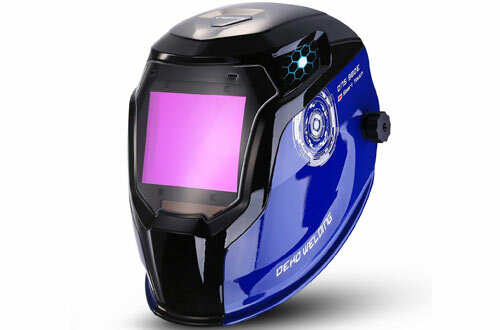 It has an additional safety feature which blinks a light at the corner once in welding helmet grind mode. This helps you to remember that you are in grind mode and prevents you from accidentally flashing yourself. Cool and unique Halo space gear design which makes it stand out from the rest. Has a pretty good optical rating of 1/1/1/2. The shell is certainly made of impact-proof nylon. Have 8 different memory settings. Dekopro has made a really versatile helmet which is feature packed at a phenomenally low price point. In the common helmets, you need to take off your helmet every time if you need to check a bit of detail in normal light. Dekopro has designed this helmet with a hinge system. It allows you to raise or lower the helmet with respect to your field of vision without taking it off. Moreover, you can move it around for full 180-degrees during work to take a look at any specific area. You even get a large display which has knobs and buttons to adjust everything. If you are running low on battery there is an indicator light that will blink on the display. Thus, it will alert you of the situation. 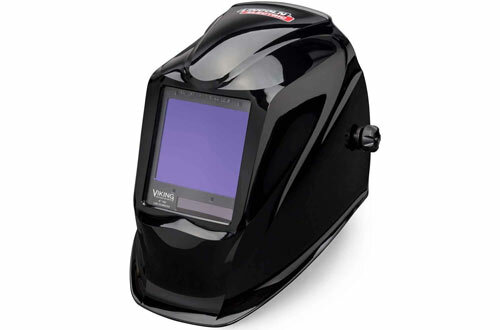 Giving a fatigue-proof experience, the welding helmet design features an auto-darkening filter. Indeed ships with extra inner lenses. Has knob and straps to adjust the fit around your head for long work hours. Sensors and solar panels are at the front of the helmet. In cheaper products, you won’t see too many sensors detecting different types of arc accurately for the darkening feature to kick in. The GX990T has four advanced arc sensors which protect your eyes by automatically darkening the screen when required. It also has a coating that blocks all the ultraviolet and infrared rays that the torch might generate or otherwise. So your eyes would be safe and sound and you can use this product for years to come. 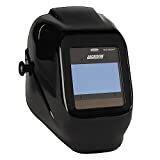 Furthermore, solar powered welding helmet has a cushiony interior that is fully padded. It is extremely light in weight and thus the protection is doubled. Indicator informs you whenever there is low voltage. Ultra fast reaction time of 1/30000th of a second. 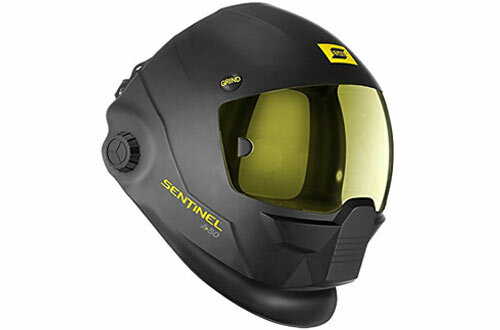 With an optical clarity rating of 1/1/1/1, this helmet has the highest optical rating achievable in the market. You have two knobs which are used for adjusting the delay and sensitivity. 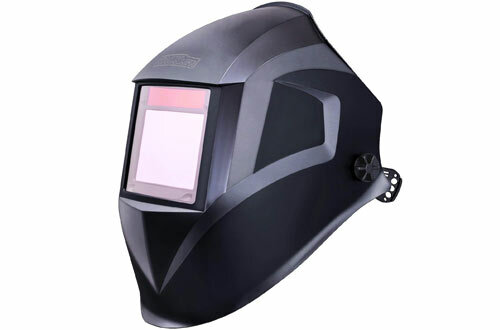 It has a huge welding helmet shade range which goes from a low of 3 to a high of 13. The design is perfectly compatible with the magnifying lens. As a matter of fact, it has a PA material construction and it will successfully withstand flames, corrosion as well as high-impact. 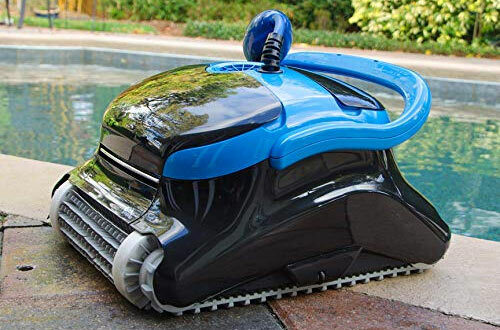 The battery is absolutely eco-friendly and the product assures amazing ventilation. Have 4 premium quality sensors on the four corners of the lens for quick adaptability. The helmet shell is of high quality and strong, but light. A big knob at the back to adjust and have a custom fit around your head. 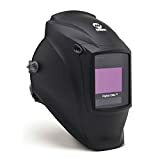 This product comes with Auto-Darkening Filter which can readily adapt to arcs in various working conditions and environments. 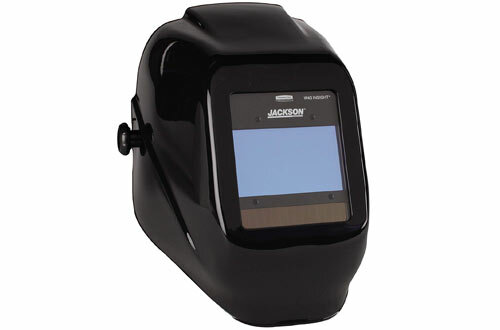 You would be able to perform any and all sorts of welding job with various digital controls inside the helmet. 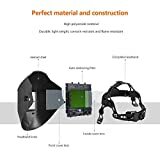 It is also immensely inexpensive and with its various sensors and great build quality, it delivers one of the highest performances. Including 4 dimming sensors that are automatic as well as independent of each other, it has an auto-darkening filter. Thus, keeping your eyes protected becomes simple. Weighs just around two pounds. The minimalist all-black colour looks nice. Comes with its own Lithium battery. At the front of this helmet, you get solar cells which power up your battery whenever sunlight is available. You also have the filter which automatically darkens the shield at the front. In fact, you can adjust the shade with the shade adjuster at the side of the helmet. The LCD display inside would really impress you with its high quality and display size. Moreover, one gets protection against IR radiation as well as UV and one gets the benefit of a large viewing area of 3.86-inches. Apart from having solar cells, it is also integrated low volume alarm. Lastly, it features an automatic on and off switch for the grinding mode. Has comprehensive headgear with knob fir strap adjustment. Shops with free safety gloves. 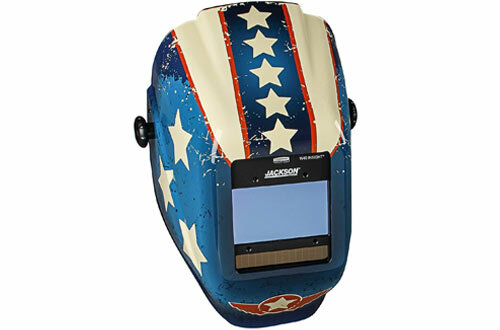 Jackson Safety brings you a helmet that takes inspiration from the great American flag. And it really embraces the American work culture. 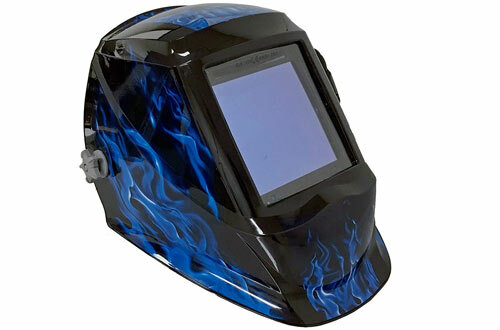 This helmet is equipped with sensors that automatically darken the lens when you light the welding torch. It has such low reaction time that your eye is always protected from sudden flashes. However, for having full control, you also have digital controls that you can adjust easily. 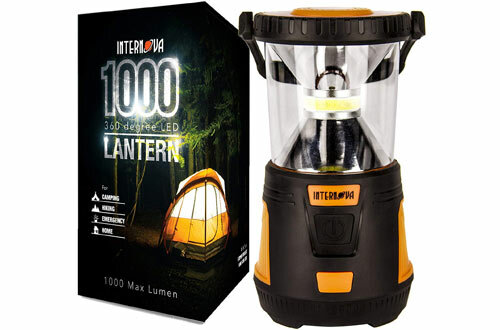 Unlike manufacturers who cut corners, this torch has a Lithium battery so that you don’t have to bear extra charges. The shade varies from 9 to 13. 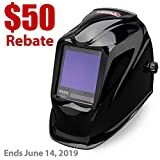 This amazing welding helmet from Miller Electric has its excellent patented technology of ClearLight ™. As a matter of fact, it is far better than what you get with cheaper and traditional alternatives. This technology implemented on the lens gives you clearer, brighter colours and better focus on a selected area. Plus, you also get several modes to work with and a wide shade range that gives you smoother work experience. 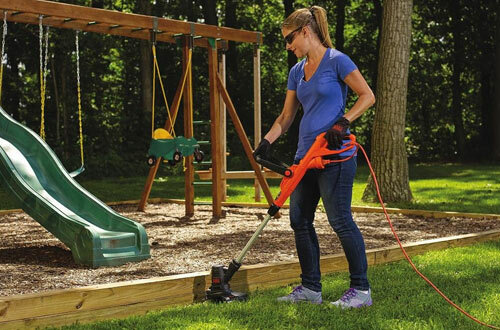 Modes vary from the weld and cut to grind and X-mode. X-mode is really unique since it completely negates any interference from the sunlight that might be dangerous at the site. A warranty period of 3 years. 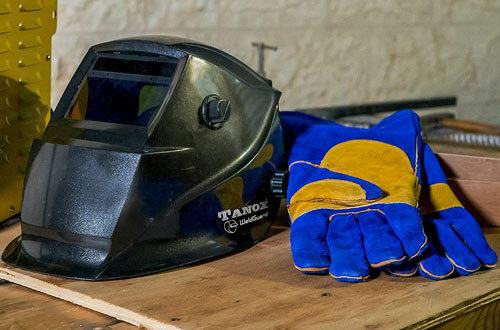 Weighs just 0.16 ounces, making it one of the lightest welding helmets in the market. Ships with a Lithium-ion battery. With a relatively high optical rating, this helmet is one of the best you can get in the market. 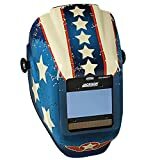 Unlike other welding helmets which have angular and sharp insides, this one features rounded surface. So you won’t have any sharp corners or lines to hurt your head. It is equipped with straps and adjustment modules that will allow you to achieve a perfect fit without intense pressure. Traditional helmets are really heavy and over a long period of time get stuffy and inconvenient. This helmet from Dekopro is made from a lightweight yet durable material. Thus, it is easy to carry and gives you a comfy experience even in harsh conditions. It features a really low and remarkable reaction time of 0.00004 seconds which acts quickly enough to protect your eyes. 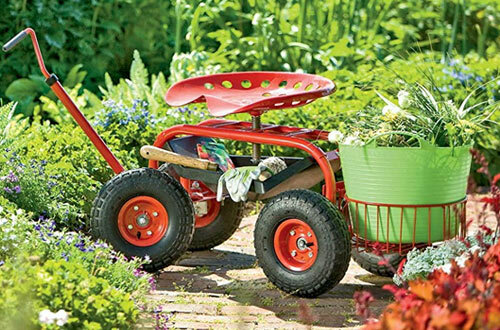 Moreover, it is environment-friendly since it has solar cells to power it whenever you are working under the sun. 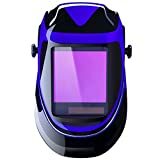 Lithium batteries have a capacity of 550 mAh which is more than enough for a welding helmet. Super long battery life of 5000 hours. Fast switching process from dark to light filter. 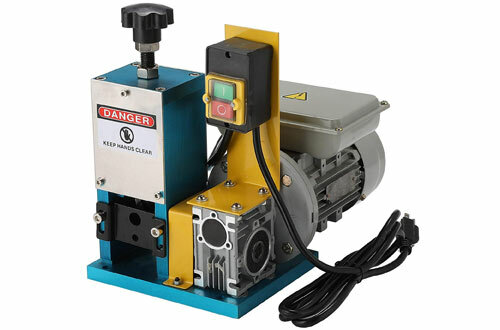 Safety must always be the primary concern in the welding process. And a good welding helmet secures you in extreme welding sessions.